I went away last week and spent it without my laptop, forcing myself to take time away from the blog in order to rest. That rest has done me good and while spending over eight hours in the back of a car travelling home yesterday, I couldn't wait to get writing again. I have a lot to catch up on but as this is my main motivation and passion, I wanted to make sure I hit the ground running. I'm not starting with a new release today or a new band, in fact this is a reissue of a split that was release 20 years ago. 20 Buck Spin has seen fit to re-issue the seminal doom/sludge split between California's Noothgrush and Japanese act Corrupted. Originally released on both 12" and CD via Reservoir Records in 2007, it's been remastered by Brad Boatright (Audiosiege) and repressed again on 12" vinyl. This version features the three vinyl-only songs from the original release and has new artwork courtesy of Hal Rotter. The 35 minutes to follow will surely be achingly bleak and harrowing if that cover art is anything to go by. Doom/Sludge has always been a go-to genre of extreme music in recent years for me. The sheer heaviness and extremity of it, coupled with the slower tempos has drawn me in on many a booze-fuelled evening and getting to listen to this re-mastered split reminds me of why. Noothgrush opens it with Hatred For The Species, which is a groove-laden and riff drenched doom song that belies their Californian roots. Thick bass, prominent percussion and tortured vocals are given a boost by the mastering and lead into Draize, with it’s peculiar sample. After the build-up of feedback Noothgrush let rip again. Their sound is hypnotic but there’s also a deceptive momentum to it. The minimalistic guitar section at four-minutes brings forth the quality of the percussion when it joins the fray. 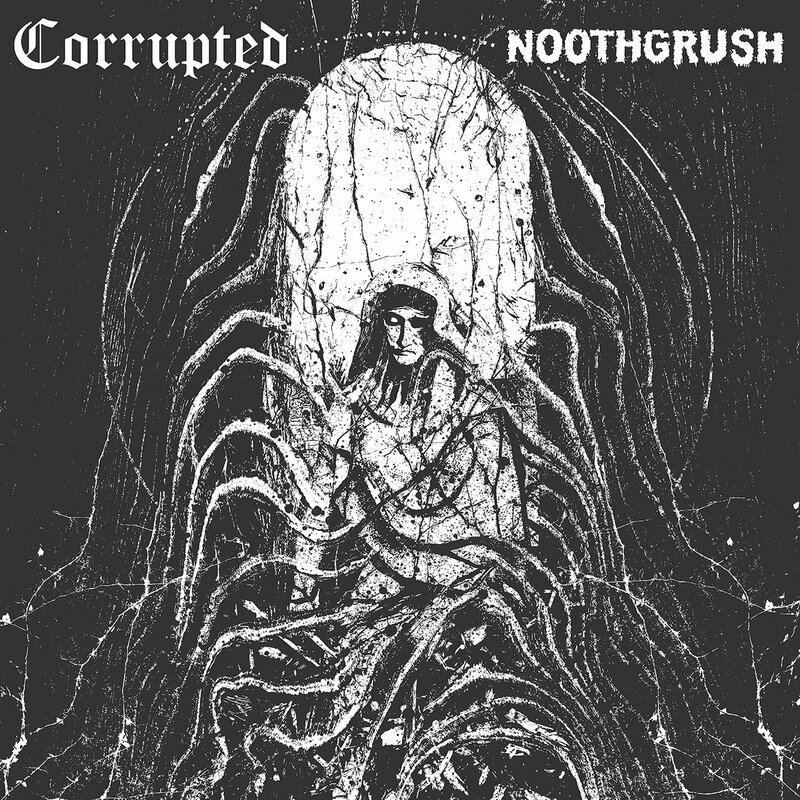 This was one of Noothgrush’s early splits but it highlights the difference between them and many of those who followed in their lumbering, heavy footsteps. Pure filthy class with an instrumental quality that's held them in high regard ever since. Japanese music and the bands that have produced it has been another fascination for me and alongside the likes of Boris and Envy, Corrupted sit. While stylistically different to both the former, they’re considered equally important. Their sole-contribution Inactive is lo-fi but somewhat more grim than those of Noothgrush. Droning and darker, it’s far from an easy listen. The guitar is more prominent and the vocals deeper. As the song lurches to it’s end, it becomes more engaging, which is an endearing part of Corrupted’s own sound. Over the years they’ve been able to craft a revered following themselves by building a seemingly bleak noise into something more encompassing. 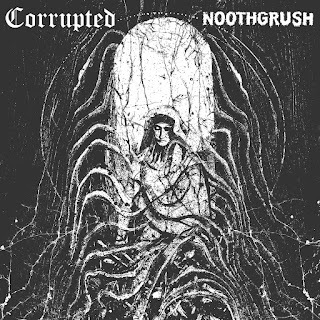 Both Noothgrush and Corrupted have been important in the crafting of today’s musical landscape and on the 20th anniversary of their recorded union they’re equally as relevant.